The U.S. Social Security Administration (SSA) assesses a cost-of-living adjustment (COLA) to beneficiaries each fiscal year. The idea is to make sure money going to seniors keeps pace with rising costs. U.S. seniors have seen a 74% increase in expenses since 2000, according to The Senior Citizens League (TSCL) on Sept. 30. Meanwhile, the COLA has increased benefits just 43% across the same time period. 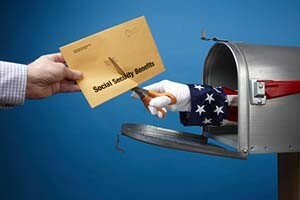 TSCL's review showed that average Social Security benefits in 2000 were $816 per month, and $1,166.30 by 2015. However, the study found that "just to maintain the same buying power they had when they first retired," beneficiaries should have received an average of $1,419.00 per month in 2015. It's getting worse. On Thursday, this gap between cost-of-living increases and lack of COLAs widened. The SSA announced there will be no COLA to beneficiaries in fiscal 2016. This marks the third time in six years COLA has flat lined. In other words, the U.S. Labor Department assesses inflation specifically using a subset of the CPI called the CPI-W. The data used to calculate the CPI-W comes from "urban consumers" that derive "more than one-half of the household's income from clerical or wage occupations." Additionally, "at least one of the household's earners must have been employed for at least 37 weeks during the previous 12 months." First, "the CPI-W population represents about 32% of the total U.S. population," according to the Bureau of Labor Statistics. Second, that 32% it represents are in a younger demographic than the elderly receiving Social Security benefits. They are wage earners active in the work force. The government last week cited low gas prices as the primary reason for no COLA in fiscal 2016. 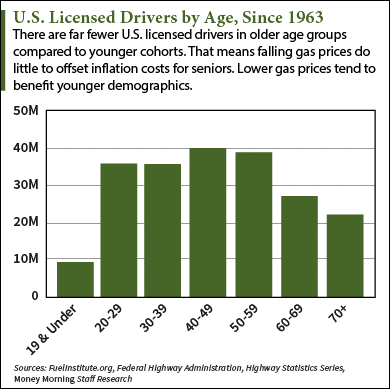 While it's true gas prices fell 23% year to date (which lowers the cost of living for active American drivers), U.S. seniors see little benefit from low gas prices – only about 12% of licensed drivers are age 70 and above. Seniors' monthly expenses aren't going toward gas or any car-related costs. What does affect Social Security beneficiaries' cost of living is healthcare inflation. 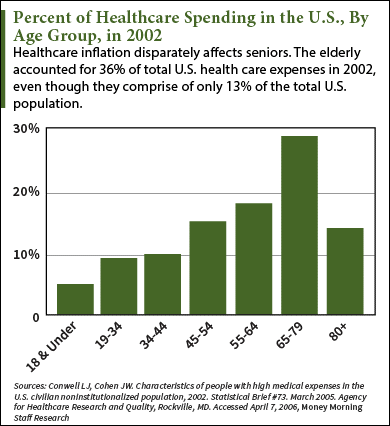 Older people are much more likely to be among the top-spending percentiles for healthcare. "The elderly (age 65 and over) made up around 13% of the U.S. population in 2002, but they consumed 36% of total U.S. personal health care expenses," according to the Agency for Healthcare Research and Quality. "The average health care expense in 2002 was $11,089 per year for elderly people but only $3,352 per year for working-age people (ages 19-64)." According to data published in BMJ on Aug. 3 by the Office of the Actuary at the Centers for Medicare and Medical Services (CMS), spending on healthcare is expected to grow at an average annual clip of 5.8% over the next decade. And according to the U.S. Bureau of Labor Statistics, medical prices rose 0.7% this summer alone – the "largest increase since January 2007." "The real inflation in the cost of medical care hasn't fully flowed into the price of insurance or the measures of total spending, despite the recent increase in these other figures," Forbes contributor and public health policy expert Scott Gottlieb, MD, wrote on Aug. 6. "There is still a lot of room to run. If the increases in the price of medical services continue, and medical demand gets back to historical norms, total spending on healthcare can start to rise even more quickly." Medical costs are included in the CPI-W measure, but for a population that spends roughly one-third as much on healthcare as seniors do. Advocates that want to change how COLA is calculated suggest switching from the CPI-W to the CPI-E (Experimental Price Index for the Elderly). It calculates CPI based on the spending habits of Americans 62 years of age and older. But CPI-E opponents argue that the purchasing population measured in the index is not necessarily identical to the Social Security beneficiary population either. More than one-fifth of Social Security beneficiaries are under age 62. Likewise, more than one-fifth of individuals aged 62 or older are not beneficiaries, but they are included in the CPI-E population. Agency for Healthcare Research and Quality: The High Concentration of U.S. Health Care Expenditures. Stanton MW, Rutherford MK. Research in Action Issue 19, 2005. AHRQ Pub. No.06-0060. BMJ: S. Healthcare Spending Will Reach 20% of GDP by 2024. BMJ August 2015. What difference does it make. We'll all be dead in a few years. This COLA business is just window dressing for fraudulent economics. It relies on distributing money put aside from other government accounts, which doesn't happen, not in the real world. It's obviously sensible to work out what a reasonable payment might be in each case, but to total it against Tax receipts etc is completely unnecessary. State benefits, which are not paid by free to create money can be subsidised by the Fed, which can create money. 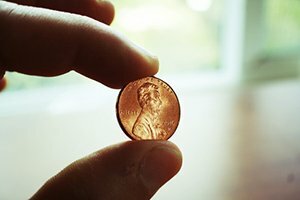 The Fed, uniquely, can net credit any account with money raised from "Thin Air", in other words, not beholden to a double entry system. There is no requirement to offset any payment, no need to rob Peter to pay Paul, both can be afforded. Because modern mainstream economics is so ignorant a great deal of damage is being perpetrated on countries by distorted economic theory. Perhaps chief among them is the nostrum the government has a finite amount of cash which means some people miss out. In reality all can be paid; a living wage, free education, free medical care for all, and "full" employment. 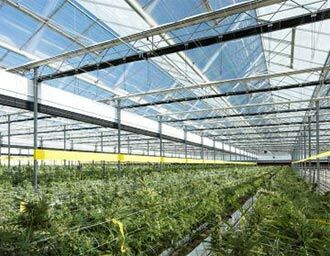 The Government can set up schemes to do all these and not be worried about any shortage of money. The practical limit is simply excess inflation and that today is $Trillions away over the horizon. If we want to prosper[at least until we exhaust our resources] the Government has to START SPENDING. That means deficits, which fuel the non government economy. the so called cost of living adjustment does not have anything to do with actual price increases that retired people face. for instance oil prices where I live in MAINE have already risen about 15% over last year's prices. in MAINE as in most other northern states this is one of the highest expenditures most retired people face. I lowered my thermostat by 2 degrees and at age 84 it is very chilly now. I have stopped giving to any and all charities also. one of the reasons I did this is because many Americans seem to admire people that give nothing to charity. now they admire and elect people that never give, but only TAKE. now he wants to take away our freedom of speech. what next?